March 27th through March 31st was Major Madness on campus. Students celebrated Major Madness March 27th-March 31st. Photo courtesy of Bailey Smith. March 27th through March 31st was Major Madness on campus. Each day featured a different event for students to participate in and gather with their fellow peers. 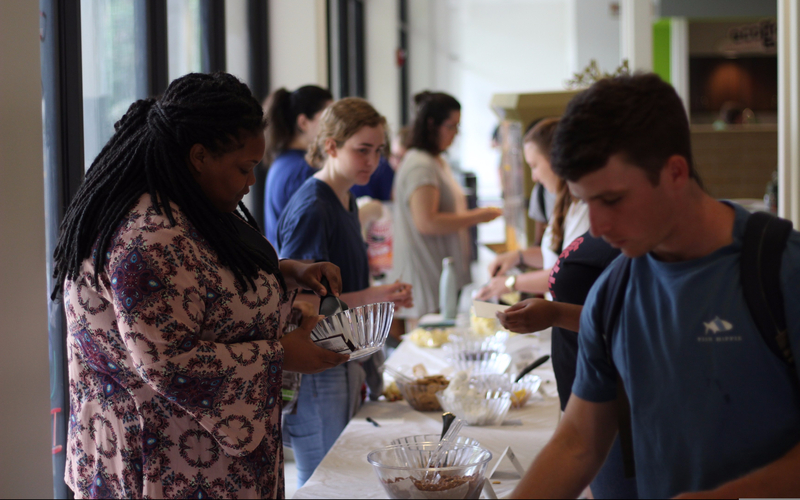 On Monday, March 27th, students gathered in the Leggett Living Room for a chance to be taken around the world at the Intercultural Festival. Some waltzed around the room in clothing inspired by several different cultures while the aroma of food spread around the room. The event consisted of singing, dancing, and a fashion show. Food options from several countries like America, China, and Brazil were available. Students left with a full stomach, and the free t-shirt didn’t hurt either. Shivangi Patel, a freshman biochemistry major, said this was her favorite event. On Tuesday, the Programs and Activities Council hosted “PAC a Bag” in the same location. PAC offered a bar that contained an assortment of popcorn, several candies, and nuts to create a treat bag. Another major madness event held on Wednesday was canvas painting, which was held in the Kava House. The event lasted from 12-4 P.M., but the canvases were gone well before then. On Friday, March 31st, over 100 prospective students and parents were welcomed on campus for Open Doors. Open Doors is an overnight visit program offered to accepted high school seniors to aid in helping them make their final decision. Throughout the day, students were able to attend classes, meet with different professors, and attend panels that featured current students and faculty. Incoming students were also given the opportunity to stay with a current student overnight. Those that chose not to stay overnight were given the option to have a buddy on campus to explore with. Jocelyn Green, a freshman neuroscience and cognitive studies major felt that the best part of Major Madness was being able to help her prospective student. Amada Jones, a senior high school student from Rocky Face, Georgia, liked the interpersonal aspects of the campus. Derrick Dupuy, a senior high school student from Slidell, Louisiana also had high remarks for the campus. Friday night several chose to go to the “Glow Fest” in Galloway Green. Students arrived with painted faces, glow bracelets and were ready to dance with both current and prospective students. On Saturday, April 1st, students attended the annual crawfish boil. Students lined up around the Plaza for an aluminum pan filled with crawfish, sausage, potatoes, corn, and shrimp. Students sat and ate and enjoyed each other’s company, and thus was the end of Major Madness.